The Galaxy is an amazing place. Twin suns setting over baking golden sands. Cities of steel floating amidst the clouds. Roaring rivers of fire and sweeping plains of ice. Nebulas that ebb and sparkle against a blanket of midnight. A thousand worlds, a million possibilities, an adventure without limits. 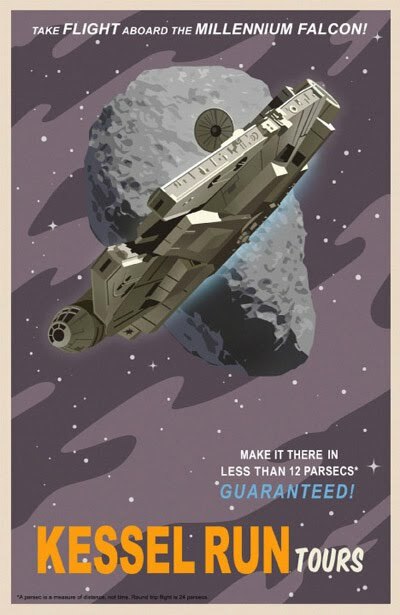 Thanks to a new age of peace, prosperity and security ushered in by the Galactic Empire, the Galaxy is your oyster. 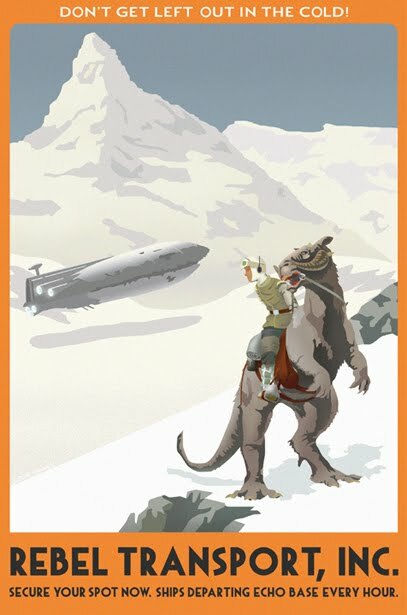 With the Jedi gone and the threat of Rebellion all but stamped out, now is the perfect time for loyal Imperial citizens to go on that vacation they've been dreaming of. Ever wanted to catch a tan on Tatooine? Dirty dance on Dagobah? Carouse with the Clones on Coruscant? 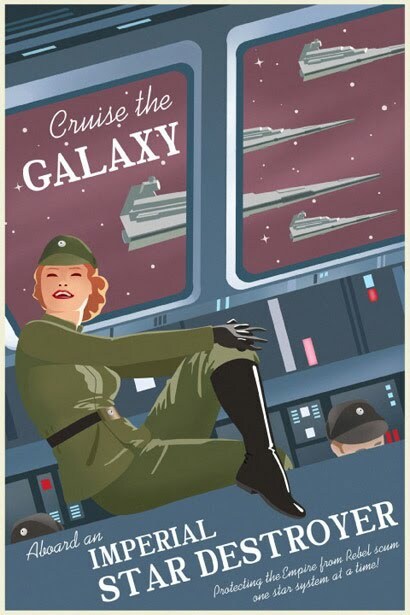 Contact your nearest Imperial Tourism and Travel Services Bureau and see the Galaxy TODAY. Disclaimer: All citizens must undergo safety checks before being approved for off-world travel. Safety checks may include luggage searches, racial profiling and making you do stupid things at Customs for our amusement, like jumping on one foot whilst reciting the alphabet backwards in a Wookiee suit. Failure to comply or success at failing these tests may result in the swift and untimely demise of yourself and your entire family. He's hoping to be able to sell them soon, so if you're interested, go leave a comment and even if you're not, go leave a compliment. Thanks for spreading the art! I sincerely appreciate it. No need to thank us! You're the artistic genius, Steve! Thank YOU!